Update July 22nd: The post has been updated after the results of IM Lake Placid (WPRO only). The following analysis is built on the available start lists posted by Ironman and assumes that there are not going to be any late entries. As you can see, I’m not counting Liz Lyles as she has announced her retirement and is expected to decline her slot. (The “formal decline” can only happen after the end of July qualifying when Ironman asks athletes to accept their slots.) 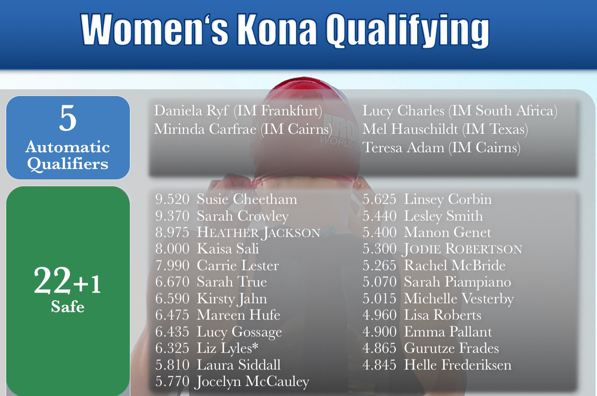 There is are also Heather Jackson (registered for IM Lake Placid) and Annabel Luxford (registered for IM Switzerland) who still needs an Ironman finish to be eligible for a points slot, but they should be able to do so in their races. With these reasonable assumptions, Sara Svensk Melanie Burke currently occupies the last qualifying spot with 4.035 points. (She has the same number of points as Melanie Burke Sara but is ahead behind on the tie-breaker top score.) Also, Helle Frederiksen is “safe” for a slot, there are only six athletes with a chance to pass her in the remaining races so she can’t fall further back than to 28th points place. The following table lists what each of the athletes who are on one of the start lists and who can still overtake Sara Melanie will need, even if that is probably not going to be enough for securing a slot (i.e. even if one can pass Sara, there are likely others that leap further ahead). In brackets I have added the (result) that will be needed to be quite certain of a slot (regardless of where others may finish, “n/a” meaning that even with a win a slot is not assured). There are a lot more athletes registered for the remaining July races, you can check start lists and seedings on TriRating.com. 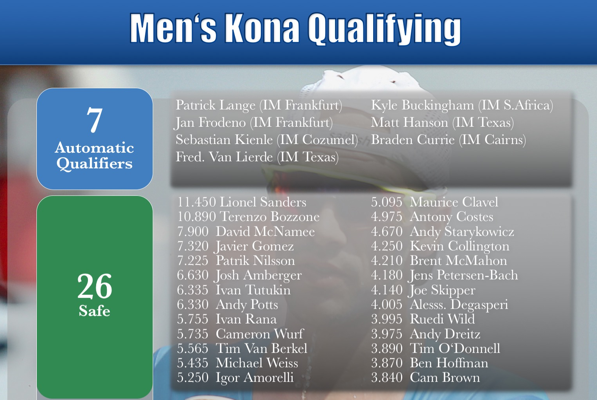 James Cunnama, Boris Stein and Bart Aernouts still need an Ironman finish to be eligible for a slot. James and Bart are registered for IM Hamburg, and “just finishing” will secure a points slot for them. However, Boris has been injured shortly before IM France, he is not going to race before the end of July. Therefore I am including James and Bart but not Boris in my “points ranks”. This means that currently Jan van Berkel occupies the last direct qualifying slot, but it’s safe to assume that a number of athletes are going to score and that more than 3.390 points will be needed. There are a few more uncertainties, for example it is unclear if Cam Brown or Marino Vanhoenacker are even interested in a Kona slot (they might decline) and whether Terenzo Bozzone is going to accept his slot (he is still recovering from being hit by a truck while training on the bike). There is a theoretical chance for the cutoff to occur as high as 3.890 points, but that requires a large number of pretty improbably race outcomes. As shown in the graph above I therefore consider everyone down to Cam Brown (at 3.840 points) to be safe, and every athlete who is able to pass Cam is going to receive in a slot unless some really weird things occur. The next table lists what each of the athletes who are on one of the start lists and who can still get to at least 3.400 points will need, even if that is probably not going to be enough for securing a slot (i.e. even if one can pass that mark, there are likely others that leap further ahead). In brackets I have added the (result) that will be needed to be quite certain of a slot (regardless of where others may finish, “n/a” meaning that even with a win a slot is not assured). 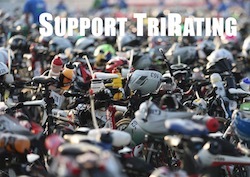 As for the women, there are a lot more athletes registered for the remaining July races, you can check start lists and seedings on TriRating.com.